Pipe Clamps for Rigid and Thinwall Steel Conduit #GPC500R GPC500R 5.553 inch 5 inch 12 gauge 25 pcs. 800 lbs. 72 lbs. Pipe Clamps for Rigid and Thinwall Steel Conduit #GPC600R GPC600R 6.625 inch 6 inch 12 gauge 25 pcs. 800 lbs. 102 lbs. Pipe Clamps for Rigid and Thinwall Steel Conduit #GPC800R GPC800R 6.625 inch 8 inch 12 gauge 25 pcs. 800 lbs. 104 lbs. Pipe Clamps for Rigid and Thinwall Steel Conduit #GPC350R GPC350R 4.000 inch 3 1/2 inch 12 gauge 25 pcs. 800 lbs. 52 lbs. Pipe Clamps for Rigid and Thinwall Steel Conduit #GPC400T GPC400R 4.500 inch 4 inch 12 gauge 25 pcs. 800 lbs. 54 lbs. Pipe Clamps for Rigid and Thinwall Steel Conduit #GPC250R GPC250R 2.875 inch 2 1/2 inch 12 gauge 50 pcs. 800 lbs. 40 lbs. Pipe Clamps for Rigid and Thinwall Steel Conduit #GPC300R GPC300R 3.500 inch 3 inch 12 gauge 50 pcs. 800 lbs. 50 lbs. Pipe Clamps for Rigid and Thinwall Steel Conduit #GPC100R GPC100R 1.315 inch 1 inch 14 gauge 100 pcs. 600 lbs. 18 lbs. Pipe Clamps for Rigid and Thinwall Steel Conduit #GPC125R GPC125R 1.660 inch 1 1/4 inch 14 gauge 100 pcs. 600 lbs. 22 lbs. 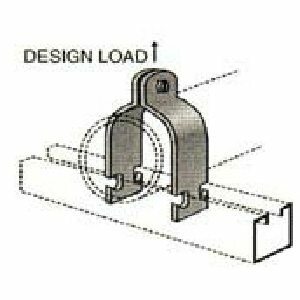 Pipe Clamps for Rigid and Thinwall Steel Conduit #GPC150R GPC150R 1 1/2 inch 1.900 inch 14 gauge 23 lbs. 100 pcs. 600 lbs. Pipe Clamps for Rigid and Thinwall Steel Conduit #GPC200R GPC200R 2.375 inch 2 inch 12 gauge 50 pcs. 800 lbs. 30 lbs. Pipe Clamps for Rigid and Thinwall Steel Conduit #GPC037R GPC037R 0.675 inch 3/8 inch 14 gauge 100 pcs. 600 lbs. 10 lbs. 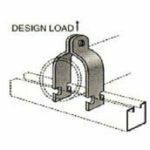 Pipe Clamps for Rigid and Thinwall Steel Conduit #GPC050R GPC050R 0.840 inch 1/2 inch 14 gauge 100 pcs. 600 lbs. 15 lbs. Pipe Clamps for Rigid and Thinwall Steel Conduit #GPC075R GPC075R 1.050 inch 3/4 inch 14 gauge 100 pcs. 600 lbs. 17 lbs.